A new treatment being offered by Healing Spot M2J, which uses aroma oil for its massages, is Far Infrared Dome. The new treatment is described as effective in improving poor circulatory and swelling problems by raising the function of internal organs. A Healing Spot M2J official adds the Far Infrared Dome treatment is good for enhancing the diet, and for eliminating wastes accumulated in the body. 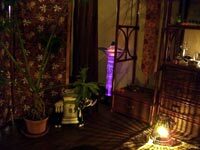 ”When I was taking this Far Infrared Dome,” said one customer, “I fell asleep, and awoke feeling really refreshed by it.” The Healing Spot M2J owner says “it is better for your body to take a Far Infrared Dome after taking massage. A promotional campaign is now under way, with body massage and Far Infrared Dome for only ¥5,000. A single one-time Far Infrared Dome treatment is ¥1,500, and an 80-minute massage is reduced from ¥6,000 to ¥4,000. Healing Spot M2J also offers an aroma oxygen charger. Reservations are available at 090-1944-0017.